Seth Godin’s simple cure for writer’s block. Why David Ogilvy called himself a lousy copywriter. A case study in the power of the blog. 10 ways to use Pinterest for your business. 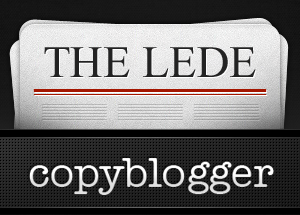 If you want more links you can use than the seven we highlight here every week, follow @copyblogger on Twitter. Leave it to Mr. Godin to supply a sensible solution to a wicked problem that has plagued writers since we were etching useful content on tablets. Stone tablets, I mean. Like most good advice, you’ll likely say “Of course…” when you read this. Don’t forget to act on it. There is some kind of relief in reading a line like that from a titan of your craft. This honest, engaging little 1955 letter from Mr. Ogilvy says much about practical professionalism, struggle, and getting your work done despite the forces working against you from within and without. Warning: do not dismiss this post for its deceptive simplicity. We’ve heard it one hundred times, and could stand to hear it one hundred more. This advice lies at the core of getting good content produced. And yes, that’s the content that can drive your business. Babe Ruth said, “You just can’t beat the person who never gives up.” That, along with a plan that changed and morphed along the way, is pretty much the story of Copyblogger. It can pretty much be the story of anyone who chooses to take it up. Mr. Lefsetz asks if you’re better off being written up in the major media, or on a major blog. Then he answers the question definitively. This might seem a bit like preaching to the choir, but the reminder — in this case — is a valuable one. With so many sensational headlines and introductions I so often see, when I read the “Comprehensive does not begin to describe this article from Ms. Narayanasamy.” introduction, I thought to myself, “let’s see if the article lives up to the introduction”. It did! Nice collection. I appreciate the Pinterest comment, it’s a good point. However, it seems that the “Pinterest is for women” is mostly urban legend. 58% women is not different than other social media sites. Pinterest has become a huge source of referral traffic for us, better than Facebook or Youtube. Our little biz is thrilled to have Pinterest around. Loved the article on writer’s block. Writing used to be my day job, so it’s always my biggest strength. People around me know that, and so they often come to me with problems of writer’s block. Often, they’ll tell me about this great idea for content they have. But they just can’t get it down onto paper (digital paper), they say. So I’ll ask them to tell me their idea. And in almost all cases, they go on to describe their idea fantastically: intelligently, concisely, interestingly. Then I’ll tell them to just go and write the content exactly the same way they just “told” me the content. Usually, this is an “ah-ha” moment for them, when they realize that writing is just talking written down. For lots of people who don’t think that their writing is a strength, this is a common problem. They see writing as something very different to every other method of communication that they’re comfortable with. But it’s not. Writing is just talking written down. That’s a big realization to make when you lack confidence with your writing, and it’s one that Seth’s article on writer’s block reminded me of. Great list of articles. I’m just off to read Seth Godin’s writers block article :). Robert, thank you for sharing. I especially liked the article on Content Marketing. The most important thing about these articles, is that they are produced by the daily experience of the experts. I enjoyed reading this and I wish this kind of material would be in the hand of every business professionals, specially from my country.